Look into the eyes of a large silverback gorilla and he'll look back with a thinking, intelligent gaze, mindful that you're another individual. Any apprehensions or nerves you might have had during your trek will melt away the minute you see your gorilla family. Gorilla trekking safaris offer a magical encounter that transcends any other 'wildlife' experience we know. 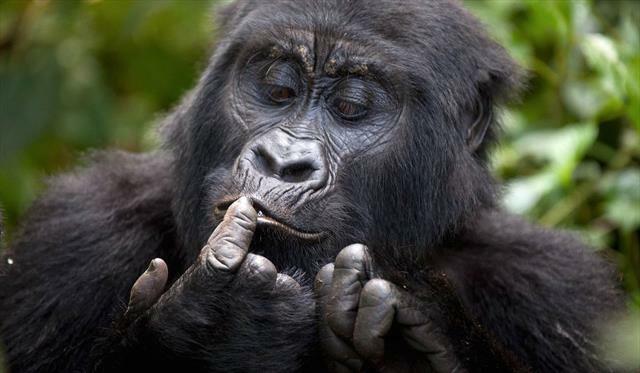 Gorilla trekking safaris can be done throughout the year. The hiking itself can be more arduous in the rainy seasons from April – May and in November, but at an altitude of 2000m and more, it can of course rain here at any time of the year. A maximum of 80 gorilla tracking permits are available each day. Permits cost US$750 per person per visit, which may seem a lot but don't begrudge it; this money provides Rwanda with a compelling economic reason to conserve the park and, amongst other things, pays for a 24-hour guard for each gorilla group. (Armed teams constantly track each habituated group – like royal bodyguards in the UK!). On the day of your gorilla trekking, you’ll set off very early in the morning to track to the apes from the edge of the forest. Your driver/guide will take you from your lodge (see places to stay in Volcanoes National Park) to the park headquarters in Kinigi village. The guides here speak excellent English and are very good. They will be taking you to a specific group of 'habituated' mountain gorillas, which they know well and are used to human visitors. You’ll be divided into parties of 8 and after a briefing on safety and gorilla trekking etiquette, you'll be driven to the start of the trail to reach your mountain gorilla group. Your guide will then lead you along generally clear paths up into the forest, in radio communication with the trackers that stay with the group so that they can be located. The altitude is over 2,500m, so although the pace is unhurried, the hike is tiring and can be steep in parts, taking from 30 minutes to a few hours. Don’t be surprised if you feel a bit breathless at this altitude – this is perfectly normal.